The Setshaba Research Centre (SRC) is an established clinical trial centre, situated in Soshanguve, South Africa. The organisation primarily focuses on conducting HIV prevention, TB, and other clinical research trials, with a strong emphasis on data quality. 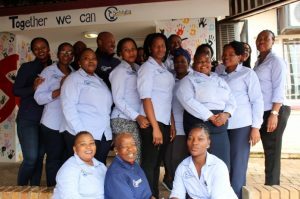 The SRC, supported by its team of experienced and dedicated staff, strives to be a centre of excellence and actively contributes to the education and upliftment of the Soshanguve community. How many participants did you enrol for the ECHO Study? SRC recruited participants from January 2016 to August 2017, in which time we were able to enrol 810 participants on to the study. What lesson have you learned during the study so far? The history of contraception has evolved so much throughout the years, but it is difficult to accept change, especially if the methods used by women have been working for them. Women tend to be comfortable with a known product. However, after receiving counselling about the three products available on the study and other methods available in clinics, they were receptive to the methods on the study and in turn comfortable with being randomised to any of the methods. What have been the most surprising things about ECHO so far? At the beginning of the study, women had so many misconceptions about the IUD. But after counselling and community education activities aimed at demystifying the methods being used in the study, the IUD is now the preferred method of choice. We have more women choosing the IUD over DMPA and Jadelle, once their participation on the study has come to an end. What are the main questions the community is asking about ECHO? One question we get asked is: Why are we conducting the study? To this we answer that we are comparing the three contraceptive methods — DMPA, Jadelle and the copper IUD — to see if there is an increased risk of getting HIV with use of any of these methods. Another question we get asked is: What happens to women who get infected with HIV during the study? To this we respond that if a woman becomes HIV positive during the study, we will provide her with counselling and refer her to a local service provider with experience in HIV care and treatment. She will stay in the study for 18 months as planned and will continue to have study visits every 3 months. At those visits, if a woman is HIV positive, we will test for the amount of virus in her blood and for the effects of HIV on her CD4 cells, which are cells that fight infection in the body. These tests will allow us to monitor disease progression and will provide information to guide her treatment regimen. We would like to thank Enough Mbatsane, Study Coordinator, and the entire Setshaba Research Centre team for their dedication to this important study and their contributions to this article.